I’m trying to make sense of A.M. Burrage. I’ve read his War is War (by “Ex-Private X”, 1930) – one of the most vivid, and definitely one of the most scabrous of war memoirs. I’m interested in the monstrous gap between the personality that comes through this book and the one implied by the romantic fiction that Burrage was actually writing for the magazines at the time of the war. Trying to investigate this, I have found that Burrage’s career gives a good view of some lesser-known aspects of the literary culture of the first half of the twentieth century. Biographical details about Burrage are hard to come by, so I am very pleased to have found the valuable essays by Jack Adrian in The St James Guide to Horror, Ghost and Gothic Writers, and in the introduction to his Burrage short story collection, Warning Whispers. These outline the basic details of Burrage’s life and career, but there are still many gaps. This essay is a working document, not a polished and finished product. Any new information I find will be added as and when I discover it. I’d very much like to hear from anyone with more information, especially about his personal life in the inter-war years. Or from anyone with ideas about where I might discover more information. Alfred McLelland Burrage was born in Hillingdon, Middlesex on 1st July, 1889. His father was Alfred Sherrington Burrage, a writer, mainly of boys’ magazine fiction. His uncle was also a writer of boys’ fiction, and a more celebrated one. He was Edwin Harcourt Burrage , author of books like Handsome Harry of the Fighting Belvedere (1894), and editor of The Young Briton. The Bodleian index shows 28 books by Edwin Harcourt Burrage, mostly stirring tales of adventure. Alfred Sherrington Burrage, on the other hand, does not seem to have made it into hard covers. No sign of young Alfred, or of Laura Parsons. Were they just away visiting somewhere on census night? Or had Alfred gone away to school? The parents’ ages seem remarkably flexible. I’ll see if I can discover which (if either) set of figures is accurate. I must not omit to mention Alfred Burrage, brother of E. H. Burrage, a most prolific author, who wrote under the names of “Cyril Hathway,” and “Philander Jackson.” He penned several stories for “The Boy’s World,” and “Our Boys’ Paper,” “The Boys of England,” and other papers. Alf. Burrage was a splendid mimic, and used to cause roars of laughter when he told his funny stories about Ernest Emmett, “The Cheerful,” and mimicked his deep bass voice and his stately walk and actions. He was a born actor, and like the rest of the Fleet Street “boys” lived up to his income. If the boys’ fiction papers provided a living, it was probably not a very lavish one. The census returns give hints about the social standing of a neighbourhood, and some of the Burrage’s neighbours in Newbury in 1901 were a tailor’s journeyman, a corn porter, a grocer’s assistant and a lodging-house keeper. Long before he reached his majority Burrage was a busy professional writer earning excellent money, and by the age of twenty-five he was not only turning out stories and articles for Boys’ Friend Weekly, Boys’ Herald, Gem (writing as ‘Cooee’) Comic Life, Vanguard, Dreadnought, Triumph Library, Cheer Boys Cheer, but unlike his father and uncle, had branched out into the even more lucrative adult market. Adrian notes the help given to the young author by Isobel Thorne, who presided over the off-Fleet Street publishing firm of Shurey’s. Adrian characterizes Shurey’s publications as “low in price, modest in payments, but whose readers were avid for romance, thrills, sensation, strong characterization and neat plotting”. Isobel Thorne has been credited with pushing Edgar Wallace into writing the Sanders stories that were the foundation of his career as a fiction writer. [W]e might get turned down by the Strand, but there was always the hope of landing with Nash’s, the Story-teller, the London, the Royal, the Red, the Yellow, Cassell’s, the New, the Novel, the Grand, the Pall Mall, and the Windsor, not to mention Blackwood’s, Cornhill, Chambers’s and probably about a dozen more I’ve forgotten. By the time of the Great War, Burrage was an established magazine writer, having been published in prestigious magazines such as the London Magazine and The Storyteller, as well as more downmarket ones like Short Stories Illustrated (40 pages for a penny, and it doesn’t even rate an entry in Mike Ashley’s Age of the Storytellers). A man in his mid-twenties was eligible for service in the Armed Forces, and in December 1915 Burrage attested under the Derby scheme – which means that he affirmed his availability to enlist if called upon. In 1916 conscription was introduced, and Burrage seems to have pre-empted this by volunteering to join the Artists Rifles, a territorial unit. He would have enlisted at the Artists Rifles Headquarters in Duke’s Road, near Euston. The building is now used as a dance studio, but this terracotta sculpture of Mars and Minerva is still above the door, through which AMB would have passed before he met the recruiting officer Captain C.J. Blomfield, to read the oath and kiss the Bible. 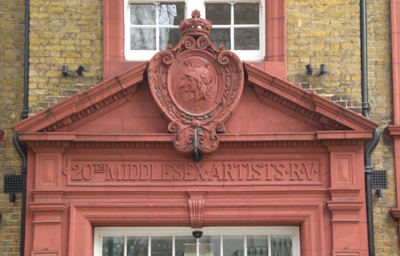 The Artists Rifles formed in the middle of the nineteenth century as a volunteer group of writers, painters, musicians and engravers; Minerva and Mars were their patrons. They founded their headquarters in Dukes Road in 1880, one of twenty-eight volunteer battalions that combined to form the London Regiment. Dante Gabriel Rossetti had served with the Artists, as had Algernon Swinburne and William Morris. [….] Eventually recruitment was limited by recommendation from serving members (‘they let in anybody now who will pay 25/- a year subscription’, Thomas complained), but for the time being it was a popular choice among university and public school graduates, who were frequently considered such capable officers that they were poached by other army units or chosen to set up Officers Training Corps. In excess of 10,000 officers were commissioned during the war after training with the Artists Rifles. The Royal Artillery alone took over a thousand. But they suffered appalling casualties; some 6,000 of the 15,000 serving Artists were killed, wounded, or posted missing or captive. In War is War Burrage strongly insists that he was a volunteer, not a conscript, but joining an upmarket territorial unit might have been an attempt to get a more socially congenial army posting; had he waited to be conscripted, he could have been put in with men that he would have found less congenial. Unlike Thomas and Owen, he did not progress to a commission. In War is War he hints that this was because he was a very unmilitary person, and an unsatisfactory soldier (while being scathing about the quality of many of the officers set above him). Might it also indicate that his formal education was sketchy, and not of the sort that would have qualified him as officer material? In War is War, he writes: “Even after conscription had been brought in I might have been kept out on compassionate grounds.” which refers, I think, to the fact that he was supporting his mother and two other female relatives by the efforts of his pen. They seem to have been totally dependent on him, which is one reason why he kept on writing stories during wartime, even when with the army in France. His uncle, the more celebrated storyteller Edwin Harcourt Burrage, died in 1916, which might have made the relatives’ dependence on Alfred’s pen even more obvious. Burrage seems to have regarded writing essentially as a means of money-making; though he enjoyed the activity of writing, in War is War he expressed a low opinion of what he produced. It was a great relief to me to write when it was at all possible – to sit down and lose myself in that pleasant old world I used to know and pretend to myself that there never had been a war. Some of my editors seemed of the opinion that we were not suffering from one now. One… used to write to me saying “Couldn’t you let me have one of your light, charming love stories of country house life by next Thursday.” I would get these letters in the trenches during the usual ‘morning hate’ when my fingers were too numb to hold a pencil, when I was worn out with work and sleeplessness, and when I was extremely doubtful if there ever would be another Thursday. Burrage fought at Paschendaale, and in the retreat of 1918, before being invalided out of the army. He returned to the fiction magazines, which were experiencing a post-war boom. Your war stuff is the real stuff. I can follow you because I fought over the same ground; but most magazine editors employed their wartime more profitably, and that stuff means nothing to them. Moreover there is still – God knows why – a prejudice against short stories dealing with the war. There are one or two highbrow journals whose editors haven’t that prejudice, but I think both the form of the story and its lack of conviction would put them off. But, as I said, the Blue might have it if you care to chance your arm. A.M. BURRAGE is the type of young man who might very well walk out of one of his own stories. He commenced yarn-spinning as a boy of fifteen at St Augustine’s, Ramsgate, writing stories of school life to provide himself with pocket-money. Since then he has won his spurs as one of the most popular of magazine writers. Everything he does has charm and reflects his own romantic spirit – for he is incurably romantic and hopelessly lazy. It is his misfortune, although he would not admit it, that his work finds a too ready market. Nevertheless, his friends hope that one day he will wake up and do justice to himself. Otherwise he may end up as a “best-seller”, a fate which doubtless he contemplates with equanimity. “Hopelessly lazy” does not seem to fit an author who in any given month might have stories in three or four different magazines. Burrage was not a star writer (His name only occasionally appears as an enticement on the magazine cover) but he was a dependable one, producing readable work that usually stayed within its genre, and was more likely to be pleasing than challenging. Among the stories from the immediate post-war years, however, there are some that hint that he wanted to say something about his war experience, though knowing that stories of combat or Army life were not what editors required. In “A Town of Memories” (Grand Magazine, 1919) he adapts his usual romantic genre to the purpose. The story describes a young officer returning to the town where he had grown up before the war. He is unrecognized, and there is no interest in his war experiences or the fact that he was awarded the D.S.O. The townsfolk have their own interests and priorities. At the end, though, he finds a beautiful young woman who had hero-worshipped him when she was a schoolgirl, and the story ends in the required romantic manner, with the stuffy notables of the town discomfited by the alliance. During this period Burrage diversified away from romance into different genres. Even before the war he had experimented with stories of the supernatural (the genre for which, after his death, he was to be best remembered). “The Recurring Tragedy” (Lloyds Magazine, 1920) deals melodramatically with a General who had used his men ruthlessly in the war of attrition. He imagines a terrible vision of his past life, as one who betrayed Christ. These are the values of that other ex-officer, Bulldog Drummond, taken one step further. Drummond in The Black Gang sets up a proto-Fascist organisation to punish with the enemies of England in ways that the police can not – often with a rhino-hide whip – but his motives are disinterested. Dorry and Fewgin commit outright crime, and happily profit from it. In the first of the stories, they are robbing a man who made a fortune manufacturing inferior jam during the War, one Isaac Sheintz (no prizes for guessing his religion – the stories are consistently anti-Semitic). Sheintz has bought a valuable pearl necklace for Muriel Stedwich, the daughter of an impoverished family, who is being forced to marry him (Sapper used a similar situation in Mufti). Dorry and Fewgin steal it, but the morality of the story is maintained because they do not profit – the proceeds go to the impoverished decent chap whom Muriel truly loves, so that she can now marry him. Other stories deal with a second-hand dealer who cheats old ladies, so is robbed in his turn, a family of nouveaux-riches who have bought up an old family home, and are scared out of it by apparent poltergeists, and a dishonest socialist who is cheating his Russian paymasters. The most interesting of the group is about some treasure buried in wartime, and an officer who has killed the men who share the secret of it. Although the stories have their roots in the gentleman-crook genre descended from Raffles, they are significantly different from their model. Bunny, the narrator of the Raffles stories, is often plagued by conscience, and he and Raffles get their come-uppance finally. First Bunny goes to prison, and then the pair of them get a chance to prove their worth as gentleman-rankers in the Boer War. Dorry and Fewgin suffer few qualms, and in the five stories printed in Lloyds for 1921 get no kind of come-uppance or punishment. They are ex-soldiers dealing with he problem characters of the post-war world, and the stories back them to the hilt. In another post-war story, “The Enemy over Yonder” (Grand Magazine, 1919) a shell-shocked ex-officer murders an offensive war profiteer – an action is thoroughly endorsed by the narrative. In these stories Burrage seems to be demanding that someone be held accountable for the suffering of the war – and hitting out at the profiteers, socialists and foreigners who were conventionally blamed for the disturbances of the post-war world. Victor Gollancz, who published the book and greatly admired it, had to point out that the critics would hardly take the book seriously if it became known that the author earned his living producing two or three slushy love stories a week. In a 1931 letter to Dorothy Sayers, Burrage says ruefully that War is War “promised to be a great success, but was only a moderate one” so Gollancz’s optimism about its prospects were not fulfilled. This book is extremely uneven in quality. The account of the attack at Paschendaele and of conditions at Cambrai after the great German counter-attack are very good indeed; in fact among the best of their kind. But the rest is disfigured by an unreasoned and unpleasant vituperation of superiors and all troops other than those of the front line, which is all the more astonishing because the author is inclined to harp upon his social position as compared with that of many of the officers with whom he came in contact. He does not use as much bad language as many writers on the War, but his methods of abuse will leave on some of his readers at least a worse impression than the most highly-spiced language. The letter to Dorothy Sayers mentioned above is part of the correspondence about the ghost and horror anthologies that she edited for Gollancz, which included some stories by Burrage. The correspondence between Sayers and Burrage starts off as merely business, but Burrage knew Atherton Fleming, her husband, “whom I hope to encounter soon in one of the Fleet Street tea-shops.” Tea-shop being a euphemism for pub – both Fleming and Burrage were drinkers on a scale that became problematic. What you say about “The Waxwork” sounds very exciting, just the sort of thing I want. Our nerves are stronger than those of the editors of periodicals, and we will publish anything, so long as it does not bring us into conflict with the Home Secretary. Through being printed in Sayers’s best-selling anthology, this story became one of Burrage’s best-known, and it was filmed several times; in 1959 it was the basis for an episode in the Alfred Hitchcock Presents television series. Fleet Street is not a good place for a man who delights in succumbing to temptation, and whose doctor says that even small doses of alcohol are poison to him. …agrees with you entirely about the temptations of Fleet Street; he has, however, succeeded, through sheer strength of character, in being able to drink soda-water in the face of all his fellow-journalists. I have had a pretty thin time lately through illness and anxiety. And for days on end haven’t had the energy in my to write a letter [sic] , and when I had the energy to send a complete set of proofs to you I found I hadn’t the postage money (This is when you take out your handkerchief and start sobbing). I owed my late agent over £1000, so I got practically nothing out of War is War. He stuck to it. Well, he is paid off now, and so are my arrears of income tax. All this took a toll of my very small earning capacity, and I have been sold up. This on top of something which promised to be a great success and was only a moderate one, was a bit too much for me. Still, in spite of sickness I am resilient and shall float again. “You can’t keep a good man down,” as the whale said about Jonah. The phrase “my very small earning capacity” sounds odd coming from a man whose stories were everywhere, and who must have been earning several times the average wage. He could not command the rates paid to the literary stars with high critical reputations, but his fluent pen must have been earning him several pounds per thousand words, even when he was ill. Was he still having to support relatives? Did the money mostly go on booze? Was he just a chronic mis-manager? How much of the chaos of his life can be ascribed to the after-effects of the war? His private life seems equally mysterious; did this purveyor of hundreds of girl-meets-boy romances ever have a partner of his own? Well, yes, his death certificate suggests that he did – but who was she? Some day I hope to meet you, and I can give you a really good plot, which I can’t use myself, because everyone tells me I can’t write detective stories. But this one is a joy. Perhaps one afternoon, when there is nobody else about but your husband, you might like to invite me to tea(?) and I will tell you the plot. The proviso is because I obviously couldn’t tell the plot in front of a crowd, and also because I dress like a Comedy Tramp turn on the music halls. Sayers responded enthusiastically (“Rather! By all means come to tea, any time you like. I am looking forward to hearing that detective plot.”) but that is the last letter in the Gollancz archive. I don’t know whether they ever met. The self-deprecation of that letter seems typical of the man. He was about forty-two years old when he wrote it, but it seems to be coming from the depths of a ruined life. He lived until 1956, and kept writing – the Evening News alone published forty of his stories between 1950 and 1956. He was sixty-seven years old. The informant was H. A. Burrage. widow of deceased; their address was 105, Vaughan Road, Harrow. I wonder when they married, and how she coped with his unconventional lifestyle. The name of A.M.Burrage does not appear in respectable literary histories, but ghost story enthusiasts hunt down his collections, and he appears in many spooky anthologies. I’m interested in him because of War is War, one of the few Great War memoirs written frankly by a private soldier. It’s a most unromantic book to come from a purveyor of romances. Some day I’m going to get round to looking properly at the ghost stories, and maybe trying to link their preoccupations with Burrage’s life. For the meantime, though, here’s the result of my investigation so far. If you know anything else about the man, please do let me know. I am trying to find information about an Edwin Harcourt Burrage who made wooden toys and drew pen and ink cartoons in the United States (possibly Rhode Island) in the early 1900’s. Is there any relation, or any evidence to show that my EHBurrage is related to your Burrages? Burrage had an uncle called Edwin Harcourt Burrage – but I don’t know whether or not he ever went to America. if I come across any information, I’ll let you know. Thank you so much! =) That’s fantastic. ” the stories are consistently anti-Semitic.”…except that surely Fewgin- the altruistic fence is surely a reference to Fagin? It’s a reference to Fagin, but Fewgin is not presented as Jewish. There are hints that Fewgin has secret motivations, but they never seem to be developed. Very interesting reading – thank you. I have only recently acquired “War is War”, having previously read it over 50 years ago and never forgotten it. Alfred married Helene A Field in December 1919 at Steyning, Sussex. I came across ‘Ex Private X’ when searching for details of the death of someone buried in the local churchyard – or rather, his memorial is there (the fragments of his body are still at passchendaele somewhere). He was in the company next to ‘X’, of who few survived. The futile tragedy of this attack was so vividly detailed, I couldn’t have had a better source – so many died in that war with no mention. As sad as you can get, but now I know thanks to Mr Burrage! I was sorry to hear of his rather unhappy sounding life, and can understand his bitterness and obvious need to ‘escape’… bless him, and thank you. Burrage’s War Is War operates on a number of different levels. A member of the 28th Battalion, The London Regiment (Artists Rifles), which prior to the war recruited from the middling classes, he appears to detest the working class men whom he has to serve with, as the exigencies of war demanded. Despite this his best mate, “Dear old Dave Barney, hearty drinker, good comrade and consummate scrounger, to all whom all women were alike so that they were between the age of consent and seventy five!” was from that class of society he so detested. His other dislike was officers, which is rather odd given that one of the original objects of the Artists rifles was to provide officer candidates foe the army. Even more strange, is that despite his dislike of the officer of the officer corps, he applied for a commission later in the war, but was turned down. After Passchendaele in 1917, when he took part in the attack on Varlet Farm, with his battalion, then part of the 63rd Royal Naval Division, his attitude seems to change. The appalling conditions and the loss of life seem to hit home, and his cynicism is tempered somewhat. Discharged in 1919 he marries, but appears to miss the comradeship of his wartime days and re-engages in the Artists Rifles. His marriage in 1919 may well have something to do with this as well as he tries to pick up his writing career, coupled with his responsibilities as a newly married man. Burrage is at one,cynical, jaundiced, observant and often hilarious, but never dull. And the man? Complex, to the point of being unfathomable. My daughter had to read The Green Scarf for an 8th grade English project. Interesting writer. I would be interested in reading more. I find it odd that the teacher chose a story with so little known about it. I tried to do some research on the story to help my daughter and it is really non-existant. Thanks – I hadn’t realised quite how extensive the family literary business was. A M Burrage also wrote “The Escapades of Esme!” serialised in 13 parts in Modern Boy magazine in 1930 (No103 25/01/30 to No115 19/04/1930). It seems to be a sequel to “Poor Dear Esme” set four years later when Esme is sent down from Oxford. Out of a job, he accepts a position as governess to a small boy. Thanks for this. I shall track it down – though I must be careful. While I was reading “Poor Dear Esme” in the Bodleian, I got rather worried that my snorts of delighted laughter were disturbing other readers. Thank you for your already very informative and enjoyable biography in progress. I have only just encountered A M Burrage, in the form of two very good ghost stories in Roald Dahl’s Penguin selection. My interest is piqued! I shall track down as many as I can. If I find anything of interest or unexpected I shall let you know. I’m so proud to have such amazing talented writers in my family and I’m looking to find his stories to keep as treasured keepsakes! They would be wonderful to pass on to the future Burrage family generation. I want them to know where they came from. I am Edwin Harcourt Burrage’s great grandaughter Olivia. How nice to hear from you. What relation are you A.M. Burrage? Great-neice? Have you any family legends about this dynasty of magazine writers? went to Canada to visit. John moved first to Saskatoon,Saskatchewan,Canada and later moved to Haney British Columbia after raising 3 boys, Robert,Richard and my father Douglas. I will fill you in more in a day or two. “War is War” certainly deserves reprinting. Its jaundiced view of the war more is closer to post-WW2 sensibilities than that of most other 1914-18 memoirs (Guy Chapman’s, for example). Thanks for the excellent biography and commentary, George. “War Is War” stands head and shoulders above all other war memoirs, in my opinion. In response to your request for more information, I can add that he is buried in grave 57, Plot C, Pinner New Cemetery, Pinner Road HA5 5RH. Poor Dear Esme is utterly brilliant. A M Burrage’s only child was Lt Cdr Julian Simon Field Burrage who died in 2013 – his daughter Susannah Burrage is the current copyright holder. I’ve just read “War Is War” for the second time – the first occasion being some 50 years ago. The critic who complained that it is uneven in the quality of the writing probably has a case but I will certainly be bringing some of its passages to the attention of my high school students. Burrage’s descriptions of trench warfare are as good as anything I’ve read anywhere else and as a proud New Zealander I was thrilled to read about his approbation of Kiwi soldiers. I’ve got “up to scratch” by AHB if you’d like it?